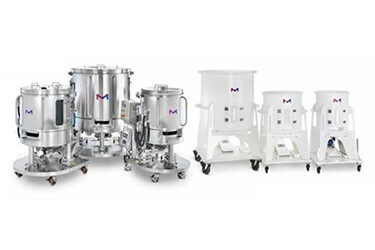 Mobius® Power MIX is a family of high performance, single-use mixing systems targeted for mixing in biopharmaceutical product/process development and manufacturing. Although primarily designed for the processes of mixing high concentration buffers and floating media powder, the Mobius® Power MIX systems also meet the challenge of blending in high viscosity solutions. Characterization of mixing performance through a range of viscosities in the Mobius® Power MIX 100, 200 and 500 L systems provides an understanding of the relationships between mixing time and solution viscosity.